« Is it Necessary to Identify The Crystal Type? 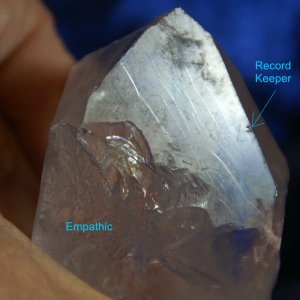 Tagged crystal types: empathic, healing crystal, how to. Bookmark the permalink. Hi! I am what some people term an incarnated angel and one of my major flaws is an inability to accept or tolerate imperfection. My crystal dropping and breaking is actually helping me to deal with and learn to accept imperfection. I am learning to appreciate it all the more because of it’s new imperfections. This is a hard lesson, isn’t it, Vanessa! It’s nice to have our crystal friends to remind us that our flaws sometimes are what makes us more lovable. Thanks for your comment! I dropped my crystal wand right after I purchased it .I took it out of the bag and it fell out of my hand and broke in half. At first I was angry and disappointed in myself, but after reading what you wrote I do feel better about breaking them.I picked them up and held them and now I have two wands to work with. They are still beautiful. It IS so difficult when these things happen, but like you said, for a reason. I’m glad this post spoke to you and hopefully gives you a little peace about it happening and maybe some insight as to what the lesson is. Thanks for your comment! I recently received a crystal from a friend who passed away last year. I was cleaning it and dropped and broke it. I feel terrible. I am hoping I can at least glue it back together. Your comments did make me feel a little better. thank You! It is difficult when this happens, I know! Glad to hear that the post helped you a little. Thanks for your comment! This might be called serendipity … I found your blog cause I was searching for an answer to a broken crystal question:) Yours was the first one I read and found an answer that really speaks to me and would like to share. It got me really upset and full of frustration and that frustration manifested in an abrupt, angry mouvement that caused my bowl to flip and the crystals and gems to drop. Rose quartz being about self love, unconditional love for one self and others, compassion . YES, YES AND YES. The chipped rose quartz is a clear indication that I do. And I will. I will start meditation with my chipped rose quartz, asking for forgiveness and loving light. WOW! Thanks for sharing, Gabi! Your rose quartz was really talking to you, wasn’t it!!!?? Your meditation with it sounds like a beautiful plan. Now you can look at your crystal, (that you love), and remind yourself to love YOURSELF with all your chips, dings, and perceived flaws. You are perfect, just as you are. 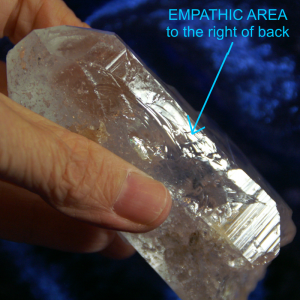 Here’s another blog post that you might find helpful on Empathic crystals (which your rose quartz is now). 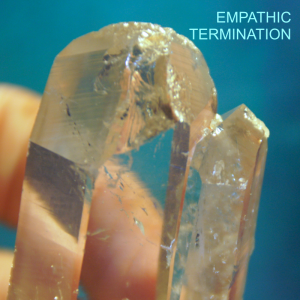 Often the lesson of Empathic crystals is to remember to be compassionate and empathetic to our OWN chips, dings and perceived flaws and to remember we are still beautiful, whole, lovable and worthy. Thank you again, so much, for sharing!